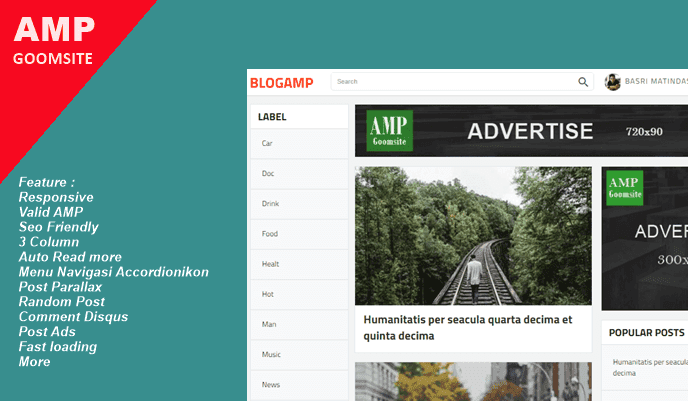 BlogAMP Valid AMP Responsive Blogger Template is Accelerated Mobile Pages (AMP) for Blogger Templates. This is a design with a Personal Blog view, just seconds to load and run it all. This template is configured and upgraded to super SEO friendly, Valid AMP HTML and also mobile-friendly. This template is perfect for you advertise users, with a super clean look makes this template has a fairly fast loading speed. BLOGAMP is a template designed specifically for adsense users and it looks that will make the visitors more beta to be on your blog. Blogamp has a material design look that follows the modern development of templates. The advantages of this template can you see below.